Feeling queasy? There's an app for that -- and it includes electrical shocks. Motion sickness is a real problem for seafaring travelers, but a bizarre new therapy could provide hope for seasickness sufferers. Dr. Qadeer Arshad, who is the lead researcher for the study at the Department of Medicine at Imperial College, said that while it’s not known what causes motion sickness, experts expect that it is a conflict with what the eye perceives as motion and what the ears perceive, and so that was the starting point for researchers to solve the problem, he said according to a CBS News report. As a result, scientists decided to figure out if the answer was to suppress a signal that goes from the inner ear to the brain by using a mild electrical current that is applied to the scalp. To start, they picked 20 volunteers to produce the symptoms, strapping them to a motorized chair, which was rotated and tilted to simulate motions that result in seasickness. All volunteers reportedly got sick. Then, they wore a cap with electrodes, getting a mild electrical current before taking another ride in the chair. The study found that those who got the treatment had a significantly longer amount of time before they got seasickness symptoms, and also appeared to recover quicker. The findings were published in the journal Neurology. The study shows that this electrical current can indeed dampen responses in a certain area of the brain responsible for motion signals. That allows the brain to handle the contradictory input. 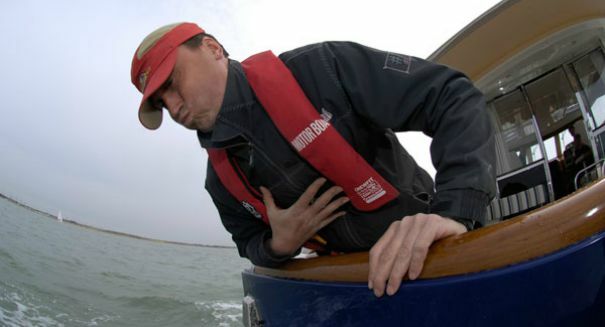 Motion sickness typically results in unpleasant feelings such as dizziness and nausea that can even result in vomiting. It is most commonly experienced on boats as well as roller coasters. Medications are available to treat it, like Dramamine, but they often have drawbacks such as causing drowsiness. This is a big problem for those who have to, say, work on a cruise ship and therefore need to deal with the symptoms while working.